Martin Meeker, a historian with the Regional Oral History Office (ROHO) at the University of California, Berkeley, argues that "Historians of the recent past, many of whom use interviews as a source, need to be more systematic about doing oral histories as a form of research [and] that cooperation with IRBs offers one way to do that." What he really means, I think, is that cooperation with IRBs may help historians get legal help from their universities. Meeker begins his essay with a description of federal human subjects regulations, interwoven with account of the relationship between IRBs and oral historians up through 2004. 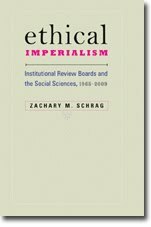 He quite accurately notes that "with individual university IRBs responding to the statements of the OHA, AHA, and OHRP in thoroughly inconsistent ways, if they have engaged with the statements at all, who and what governs oral history practices is virtually indecipherable, and the future remains unclear at many institutions." Meeker has had his own struggle deciphering those rules; though generally on target, his account is marred by some significant factual inaccuracies. The Common Rule does not apply "to all federally funded research," only to the 18 agencies that have adopted it. This does not include the National Endowment for the Humanities or the Library of Congress, both of which sponsor oral history research. Nor, as Meeker claims, does the Common Rule "mandate that the entire scope of human-subjects research within an institution be reviewed by the IRB, not just the specific research that seeks or has received federal funding at any given time." While institutions have the option of requiring IRB review of research that is not directly funded, hundreds of universities, including Berkeley, do not. that federally mandated human-subject protections were “designed for scientific and social scientific research projects that use standard questionnaires with generally anonymous sources to produce quantitative information.” Factually, this statement is untrue; logically, it is peculiar. Federal oversight was instituted to protect individual subjects who might suffer physically or emotionally because of research; uncontroversial standardized questionnaires have long been covered by expedited review. Moreover, the statement that protections are appropriate only for anonymous individuals completing questionnaires used to produce quantitative information is curious logic. If anonymous survey respondents were in need of protection, wouldn’t named participants in a revealing life history interview need to be doubly protected? Here Meeker has confused his is and his ought. Shopes and Ritchie accurately reported both the history and language of the regulations. Perhaps Congress and the National Commission should have designed rules to protect oral history participants, but that doesn't mean they did. It is a matter of record that policy makers have applied IRB requirements to quantitative surveys since the 1960s, but only in the late 1990s did they start applying them to oral history. I quite agree that much of the IRB system is logically peculiar, but it is Meeker who has his facts wrong. Most notably, Meeker overlooks the role of federal officials in encouraging and perpetuating the finding that oral history lies outside the scope of the Common Rule. He contemptuously refers to a letter written on HHS stationery and signed by the OHRP associate director for regulatory affairs Michael Carome as an "OHA-AHA statement." And he ignores the fact that the reasoning set forth in that letter has been used by the Army, Smithsonian, NIH, and OHRP itself to free federal oral history projects from IRB review. Journalism as "Blatant Bias and Even Hyperbole"
Although I tend to agree that journalism should remain exempt from review, I do so because I see journalism as inherently dissimilar from oral history interviewing—a difference that is rooted in my belief that journalism is a public enterprise, while oral history interviewing is (or should be) a scholarly one. Whereas journalism seeks to inform or influence public opinion, scholarship seeks to create or influence knowledge. While most readers approach journalistic writing with a critical eye, aware of blatant bias and even hyperbole, people tend to approach peer-reviewed research with a critical eye but also with a belief that what they read is based to some degree on serious research and applies some version of the scientific method to the answering of a question, whether quantitative or qualitative. This is a bizarre inversion of the argument used by James Weinstein to justify IRB review of the social sciences. Both Weinstein and Meeker try to distinguish information that shapes public opinion from information that does not (good luck with that!). But whereas Weinstein is contemptuous of social science as unworthy of First Amendment protection, Meeker derides journalism, with its "blatant bias and even hyperbole," as unworthy of IRB review. True, we seem to be entering a leaden age of journalism. A previously serious trade publication gives space to a blogger who boasts, "it is not my job to read" the scholarship she criticizes. An innovative radio program subcontracts its investigative reporting to a performance artist, then acts surprised when he fabricates part of the story. And soon the last Washington Post reporter left will be covering the buyouts of all the other reporters. But can Meeker really believe that journalism does not seek "to create or influence knowledge"? Would he say that to the face of Philip Pan, Katherine Boo, or Walter Isaacson? Or would he prefer to tell the Pulitzer-winning investigators at ProPublica that their work is not "based to some degree on serious research"? And, anyway, what does the reader's "critical eye" have to do with human subjects protection? Institutional, rather than methodological, distinctions better explain what happened at Berkeley. Meeker reports that "From the mid-1980s until 2005, then, ROHO operated under a partial 'hear no evil, see no evil, speak no evil' arrangement with UC Berkeley’s Office for the Protection of Human Subjects" (OPHS), with no IRB oversight. Then there came a Pharaoh who knew not Joseph. A new OPHS director, Rebecca Armstrong, decided that she knew better than OHRP what the Common Rule means, and insisted that her office have jurisdiction over the ROHO. "First and foremost," Meeker writes, "the OPHS wanted to ensure that it fulfilled its obligation to abide by DHHS regulations and thus protect UC Berkeley’s eligibility to receive federal funds for research." Well, there's frankness. IRB job number 1 is to keep federal funds flowing. Berkeley historians, Meeker writes, "agree with the sentiment expressed in the Illinois White Paper that we should 'discard the current one-size-fits-all" approach that relies so heavily on criteria and procedures developed for biomedical research." But he does not explain how what he terms the "Berkeley Compromise" does that. He states that "While the OPHS will review proposals, themes, and interview topics, interviewers are not expected to submit predetermined lists of interviewees (provided interviewees are not in high-risk categories) or explicit protocols (lists of questions)." Beyond that, Meeker's essay is lacking detail about the compromise in action. Must ROHO historians complete the mortifyingly stupid CITI Program? Who does these expedited reviews: someone with real expertise in interview research, or a nutritionist? What do the reviewers do with those proposals, themes, and topics? Have they ever ruled that risks to subjects are not reasonable in relation to anticipated benefits, or that the selection of subjects is not equitable? Do individual projects get any kind of useful scrutiny, or is this just a device for regulatory compliance? First, like our colleagues in the OPHS, we wanted to protect our interviewees from a variety of factors, including, potentially, lawsuits and possible repercussions from having their personal opinions widely broadcast through a clear process of informed consent. Second, considering the potential legal issues, we wished to protect the interviewers and the office they represented, to the extent possible, from lawsuits. He adds third and fourth points, but they describe only what the historians didn't want: interference with their work. So Meeker's essay really comes down to the argument that submitting to IRB jurisdiction is a way to purchase liability insurance. Undergoing IRB review alone would not be enough to ward off lawsuits. However, working closely with our IRB and abiding by its recommendations does, we think, provide a measure of protection in at least two ways: first, the OPHS is expert in litigation that emerges from research and thus can contribute their experience in this field to our projects; and, second, in the event that we are sued, the buck need not stop at the desk of the program’s director, which is key when thinking about the long-term viability of an oral history program on an intensely political campus such as Berkeley. In the wake of the Boston College case, oral historians should indeed think about what kind of legal--and political--coverage they need, and perhaps how best to pass the buck to someone else. But an IRB is not a general counsel's office, and people who talk to other people aren't the only scholars who need legal protection from their universities. A university more committed to free inquiry would protect its scholars independently of whether their work follows procedures designed for medical experimentation. As it stands, though, Berkeley has apparently told its ROHO that it will only get the legal coverage it needs if it completes paperwork that will protect the university from the arbitrary withdrawal of federal funds. If that's the case, I can't fault the ROHO for taking the deal. But if the regulations are revised to make clear that oral history is not covered, I hope Berkeley will rethink its compromise. There's nothing wrong with Meeker and Armstrong sharing ideas on how best to design interview projects, but Meeker makes a poor case for subjecting oral history to the specific provisions of the Common Rule.